In the course of the liturgical year the Church presents us with the entire Mystery of the Christ, from the Annunciation, to Jesus' birth, His death, resurrection and Ascension, and lastly His final coming. As the liturgical year ends and begins anew our attention is called to His final coming. Due to fundamentalist exaggerated focus on prophecies of gloom and doom and the number of apocalyptic movies that have appeared thinking of the end times can seem like a scary project. That is not the approach taken by the Church. In fact our understanding of the coming of Christ in the fullness of time is a message of hope, rather than of gloom and fear. Last week as the liturgical year ended we celebrated the Feast of Christ the King. It was indeed a celebration of our belief that in the fullness of time Christ will reign, and all sin and evil will be overcome. Given the state of the world today that is indeed something to celebrate. This week, as Advent begins, we not only prepare to celebrate His first coming at His birth in Bethlehem, we also remind ourselves that we are always to be ready for His final coming. We understand the apocalyptic descriptions of earthquakes and celestial calamities not in a literal sense, but rather as a way of stating that the world as we know it will not only end, but be transformed into a kingdom of Justice and Peace. Unlike the many who claim to know just when this will happen we cling to the statement by Jesus that we must always be ready, but we know the day or the hour. We Catholics likewise do not believe in a "rapture" where some will be taken to heaven sooner than others. That is a late 18th century fundamentalist interpretation and not part of the ongoing tradition of Christianity. So what is God's Kingdom? It is not so much a place as a state of being. Many scholars like to change kingdom into a verb, calling it "the reigning (or ruling) of God." Jesus came to bring about this ruling, but it is obviously not yet fully established. 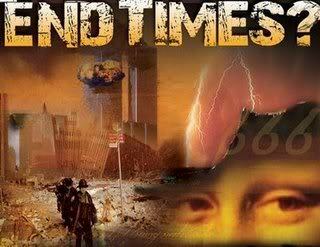 We live in the time "in between" the two comings of Christ. In our times of terrorism, racism, irrational gun-violence, crime and war it is obvious that God is not reigning everywhere. 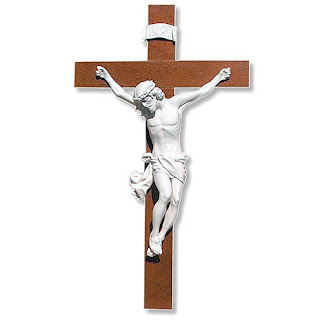 At the same time God's reign is among us now when there is love, forgiveness, thirst for justice, compassion, welcome to the poor and afflicted and all the other things that Jesus describes as part of God's reign. This belief calls us to set aside fear and to point out and bring about the promises of the Gospel, at the same time being realistic enough to see that right now the kingdom of this world is competing with the reign of God. We need to acknowledge that without giving in to fear that tempts us to use the weapons of this world to meet the challenge of evil. When we do that we are abandoning hope in the coming of God's reign and giving in to the powers of this world. As Advent begins and we prepare to celebrate the birth of the Prince of Peace let us be instruments of that Peace as we await His coming in the fullness of time. The late Eugene La Verdiere, an outstanding scripture scholar, once gave a beautiful description of how we Catholics view the reigning of God. He spoke of growing up in rural Maine and traveling with his family to the seashore. They would be coming home at night and he as a child was seated in the back rear facing seat of a station wagon (remember that?). He said the moon was so big one night as he beheld it from that position that you felt like you could reach out and touch it, yet one knew that it was really so far away. God's reign is like that, so close, yet so far away. Let us yearn for it to come close and take hold of us. Like people of good will the world over I am saddened and angry about the terrorist attacks in Paris by ISIS. I have read most of the comments by political and religious leaders and by many ordinary people. What I would like to do on this blog is offer a faith based response. I'm not suggesting that all should agree with everything that I say, but am offering a response based on my faith. When i say "my faith" I am not following some directives from on high by the hierarchy or some literalist Bible interpretation, but rather what is in my heart. So here goes. 2. Said military response should be a united effort of civilized nations. 3. It must be a reasoned response. It is understandable that our anger might lead us to a "bombs away" mentality but the situation is more complicated. This is not a fight against a nation such as Nazi Germany. We are fighting a multi-headed hydra. 4. Military force alone will not do the job. Intelligence that helps us get to the financial and communication structure is vital. 5. Pray. Just because I am listing it as number 5 doesn't mean that i don't give it top priority. 6. Do not lead fear prevail. I have seen suggestions of total border shutdown, massive bombing, etc. Yesterday I suggested on Facebook that it was hatred and racism that caused these reactions. No, it is fear. 7. While I agree with those who say that our earlier actions in Iraq made ISIS possible now is not the time to go there. Just get the job done, but learn a lesson from this for the future. 8. As regards refugees and immigrants I say again that reason must prevail. Some are connecting our present crisis of immigration from the south to this. I'm sorry but Mexicans and Central Americans, whatever problems their legal status may create, are not the problem. I am for a sane immigration reform that secures our borders and offers at the same time a path to legal standing for those who are already here, but that is a topic for another time. And please, mass deportation is a ridiculous and costly way of handing things. 9. As for refugees from Syria and elsewhere in the Middle East there are clearly secutiry issues here.We cannot randomly accept all. There must be screening. At the same time remember that many of the refugees are Iraqi ans Syrian Christians and other non-Muslims. 10. Remember, the religion of most of those killed by ISIS, AL-quaeda and other terrorists is Islam. Muslims cannot be lumped together as terrorists. Many of them are among the persecuted. 11. One of the strengths of the Catholic tradition is the use of reason in matters of faith and its application. Let's not abandon reason. Finally, I offer these points as topics for discussion. I am not an expert on world affairs. By all means draw me out, agree or disagree with various points, but if you just hurl insults back I will say "Goodbye." 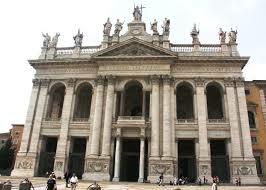 Yesterday the Church celebrated the Feast of the Dedication of the Arch-basilica of St. John at the Lateran. For most this probably seemed like one of those liturgical oddities that creep up throughout the year, but for me it evoked beautiful memories. I ministered there for seven months during the Jubilee Year of 2000. 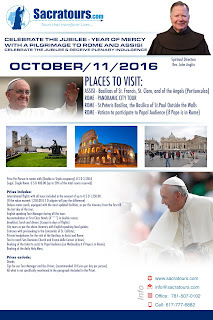 To understand this church one need only to look at the Latin inscription on the outside of it--: "Sacrosancta Lateranensis ecclesia omnium urbis et orbis ecclesiarum mater et caput"--The most holy Lateran Church, the head and mother of all the churches in the city and in the world. This is the oldest standing Christian Church in the West and perhaps in the world. 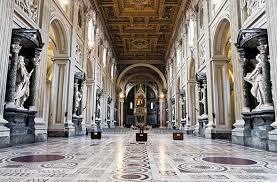 It is also the Pope's Cathedral as Bishop of Rome. Of course since it was built in 325 or so the Eucharist was celebrated in other places before then. Nonetheless all other churches are historically connected to this, not only as buildings, but because, as the liturgy of the day tells us, the Church is made up of "living stones". 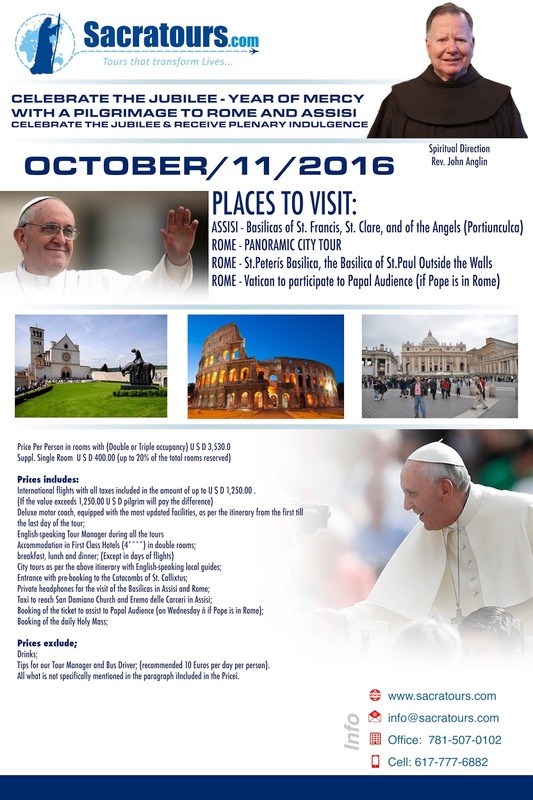 I went there to serve as a confessor in three languages--English, Spanish and Italian. Our order has been entrusted with ministering the Sacrament of Reconciliation there for several centuries. We have friars there permanently, but extras were needed for the jubilee and I volunteered to serve from June, 2000 to early January 2001 when the Jubilee ended. As the weeks and months moved on my personal experience mirrored the history of the place. While I obviously cannot comment on things told to me in the confessional I can truly say that the role of this place as mother of all churches came alive in the variety of people that I met while celebrating this beautiful Sacrament. I literally encountered people from every continent and from countless countries who came there to find The Lord's mercy. 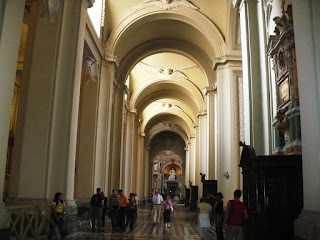 I also found that the structure of the basilica was a microcosm of the Church as a whole. The pictures here tell some of the story. On the left you see the mosaic in the half dome. At the bottom is the river Jordan, representing the waters of baptism from which the Church, depicted in some of its saints, grows. Below one sees the main aisle with immense statues of the 12 apostles, representing the Apostolic foundation of the Church. To the left there is another aisle. I suppose that Pope Francis would call it the Church's filed hospital. 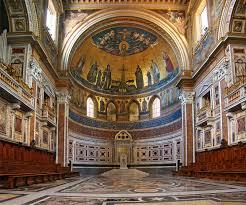 You see in one picture the confessionals where I served during the jubilee and above you see Bernini's Pieta', not quite as beautiful as Michaelangelo's, but a place where women who had lost children to death came to pray. Finally, I could not fine a picture for the aisle to the right but that was the place where various searchers and seekers milled around and perhaps entered a souvenir chop which is there. When you put all of that together you get a wonderful picture of what the Church is--a great mystery uniting in Christ saints, sinners and seekers alike.